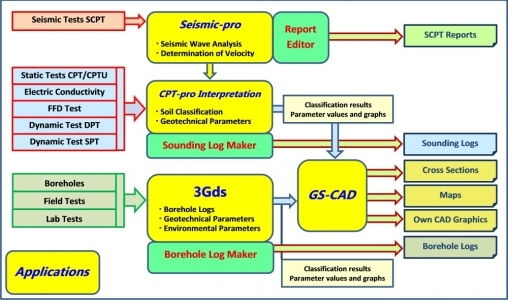 The 3Gds is a software package composed of databases and tools for administering, analytical and presenting purposes, enabling to store data, to run their analysis and interpreting and to prepare documentation in the areas of geology, geotechnics and environmental engineering. The 3Gds package is especially intended to serve for medium and large companies composed of many co-operating branches where geological and geotechnical documentation is prepared by many people. All soil characteristics, results of investigations and interpretations are stored in databases. Operation controlled by SQL servers (such as ORACLE, MS SQL Server) ensures data safety, quick access and full multi-access. Data may be also accessed via Internet. The structure of databases and related tools enable to generate databases practically of any size, the limitation is only due to the computer hardware available as well as due to the parameters and settings of the database server. As numerous glossaries are available, data are entered to geological database efficiently and quickly. All glossaries are fully editable, so the information may be adapted to individual needs in a simply and natural way. Geological database enables to store information on geological boreholes and results of geological investigation. Wide range of geologic layer characteristics available allows for complete information about individual geological boreholes and layers separated in them to be stored in the database. 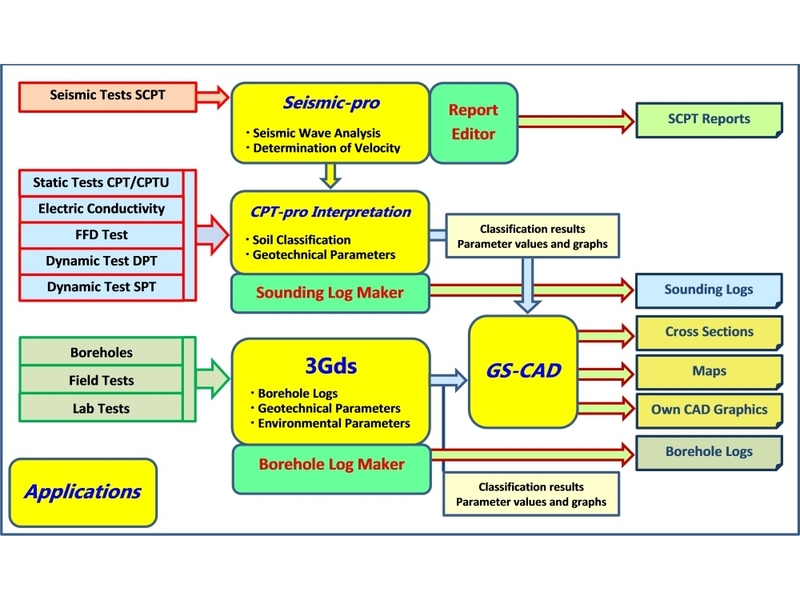 3Gds is totally consistent with USCS (Unified Soil Classification System), i.e. it includes all fields and glossaries provided within USCS Standard. Three independent each other co-ordinate systems are used to represent location of individual bore-holes: local Cartesian system (coordinates X, Y and Z), geographical system (latitude – longitude) and “road system” (position is defined by specifying the road name and distance between borehole and road axis). 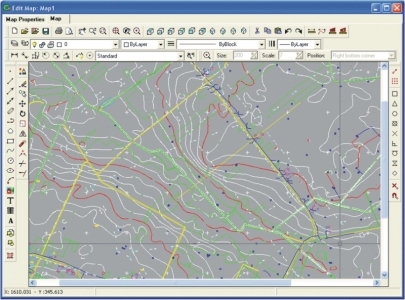 3Gds includes geotechnical database with values of different geotechnical parameters and soil samples. All parameters that are single values, sets of values or functions of some parameter vs. another one can be saved and linked to relevant borehole, depth and soil sample. In case, when set of values is saved for certain depth, User may select criterion to select representative value. The graph of [Representative value vs. depth] can be automatically added to borehole log and cross section. Parameters that are function of some index (like torque is a function of angle in VANE test or length of sample is a function of load in oedometer test) can be saved with whole path for further analysis. Borehole Log Editor is designed for creation of borehole logs and graphs of parameters saved in databases of3Gds. The template of log can be freely designed by User, saved and used according to current needs. Tools used for creation of template are similar to ones used in modern text editors (like MS Word). User can freely design the header table i.e. table with general descriptions of borehole like name, location, date etc. Any kind of standard graphic file can be inserted as own logo. All cells can be freely combined vertically, as well as horizontally. Width of columns can be modified with mouse cursor. 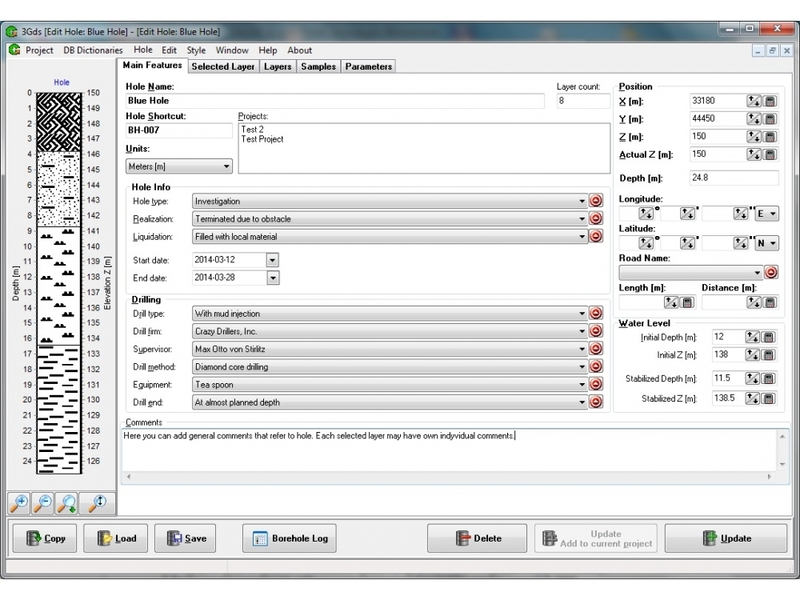 All texts generated in log can be freely modified usingBorehole Log Editor tools, exactly in the same way as in text documents. All functions like bold, italic, underline, color, alignment, frames and many others are available. The crucial is, that all these modifications concern only generated borehole log document, but not entries in database. The main part of borehole log i.e. 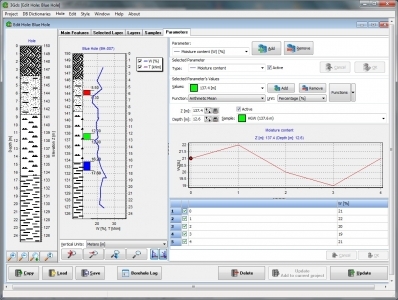 columns that include the soil stick, ruler, descriptions of borehole profile and graphs of various parameters can be customized in the same way. User can define the number of columns and its contents. Vertical scale on printout can be freely adjusted. All texts included in text columns (soil type, color, odor etc.) can be freely customized and edited by User. Borehole log can be saved as *.3Gds file with all connections to database, PDF file and *.DOC. The last ones can be edited in MS Word editor. The 3Gds system includes a built-in advanced CAD editor enabling to run all tasks related to generation and edition of documentation. Thus, no external CAD editor is necessary. 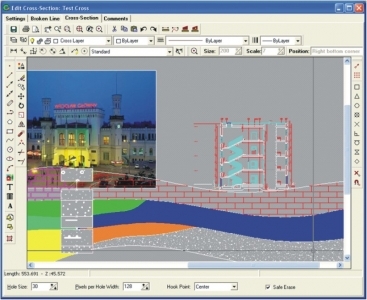 The 3Gds graphics includes standard options typical for CAD-type programs, such as handling of layers and blocks, setting the styles for basic graphic elements (including, but not limited to texts, lines, points), dynamic Zoom function, hatchings and built-in tools to calculate such values as angles between straight lines pointed out, distances between points, lengths of curves, closed curve areas, etc. The 3Gds Section Module enables to generate geological and geotechnical profiles automatically on the basis of information imported from geological database. The section line may be an open polygon (interconnecting individual successive bore-holes) or a straight line whereupon the selected boreholes are projected. 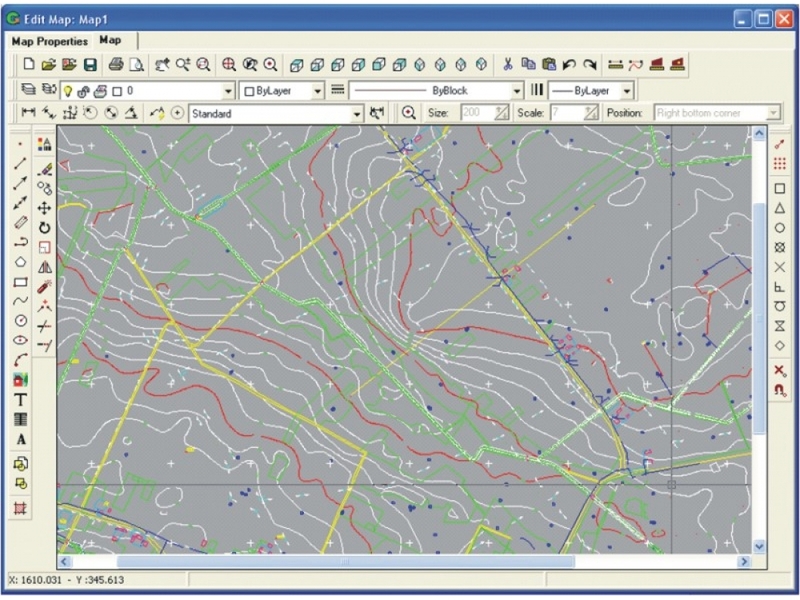 Graphic interface based on CAD-type graphics enables very quick generation of profile line and selection of holes used for the profile directly from the map including program-generated locations of boreholes and, optionally, the background of the terrain map with entered objects. 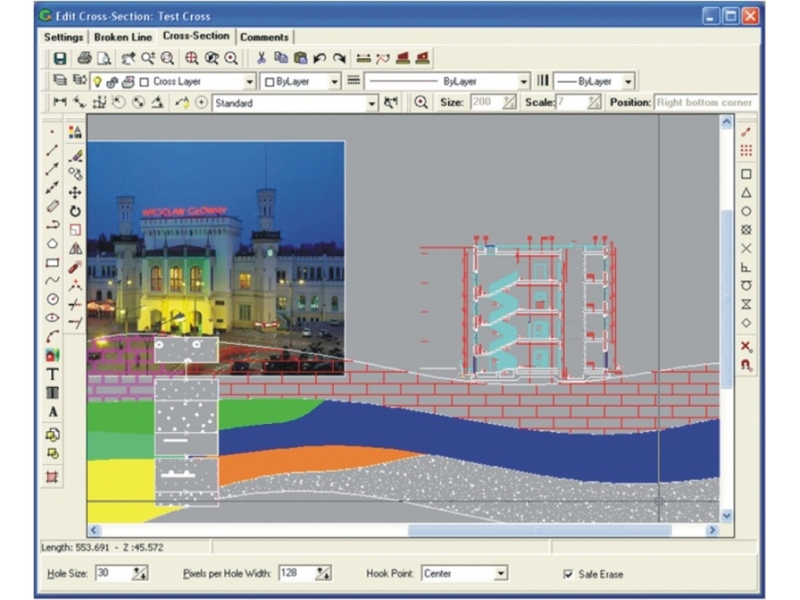 The built-in CAD editor, consistent with DWG and DXF standards, and supporting also own internal format, enables to supplement the profile with any graphical objects generated in other CAD-type programs, e.g. to place them above the cross-section of a building object under design.